When artichokes reach their ideal maturation, they are harvested between March and May, by hand. We remove the leaves from the outside to reveal the heart, which then is placed in brine with CARM wine vinegar and salt. 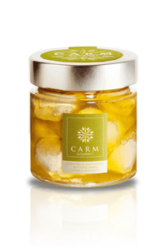 Just before packing the Artichoke hearts are married with CARM olive oil to produce a very delicate taste. They are exceptional as an appetizer on their own, in salads, pastas, or as accompaniment, the choices are endless.